I first visited Alsace, France, 10 years ago on a day trip from Switzerland. From the moment I stepped foot in Colmar, one of Alsace’s most famous cities, I was smitten. 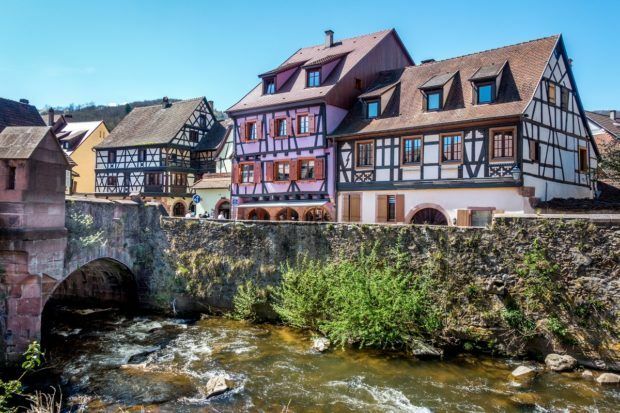 Half-timbered buildings that looked like gingerbread houses come to life, flower boxes spilling over with the colors of the rainbow, even a river cutting through town. It would be hard to imagine a place more picture-perfect. A day trip was not nearly enough. When I finally returned, I wasn’t going to miss the chance to explore Alsace more fully. 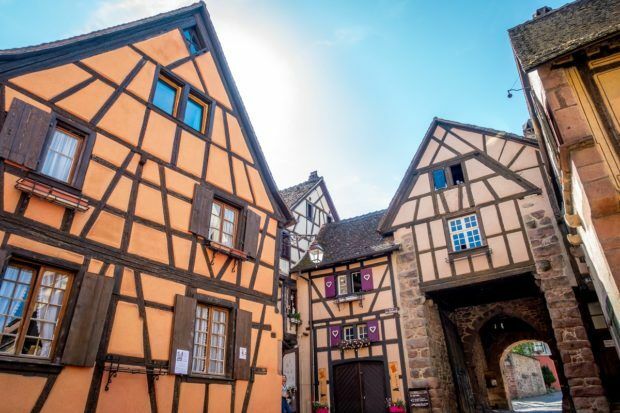 From Colmar to Strasbourg and a handful of impossibly charming villages in between, I followed the Alsace wine route (Route des Vins Alsace) through this unique part of France, eating, wine tasting, and ogling gorgeous buildings along the way. In Eastern France along the borders of Germany and Switzerland, the Alsace region has alternated between German and French control over the centuries. The result is a culture that is a little bit French, a little bit German, and distinctly Alsatian. In Alsace, there is a traditional dress with bright red skirts and vests and huge hair bows that appears in old photos, museums, and the occasional cultural festival (including one I encountered around Easter). Everyone speaks French, but the Alsatian dialect is also taught in schools, and the cuisine—heavy on potatoes and meat—feels quite German. The biggest cities in Alsace France are bustling, beautiful Strasbourg and Colmar, which has my heart. Although it’s easy to connect the two by train (in just 30 minutes), you miss the delightful towns in between. 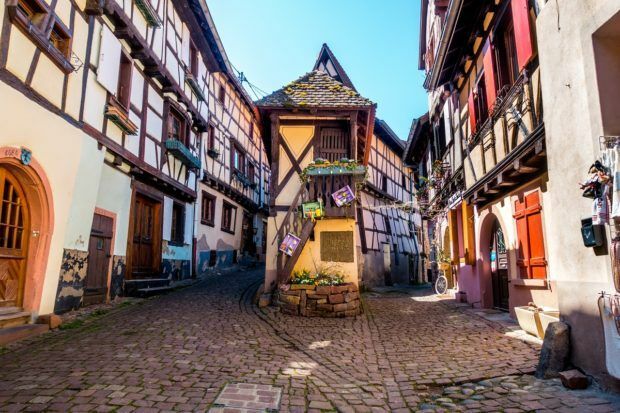 Curving back roads link the smaller villages along the Alsace wine route, which means it is easy to visit many of them on a day trip, although Strasbourg and Colmar are worth more time and are more directly linked on the A35, if you’re driving. The Alsatian history of wine-making goes back to at least the 2nd century. The quality and quantity of France’s favorite beverage ebbed and flowed over the years, but the 1300s and the three centuries that followed were some of the biggest in wine production. 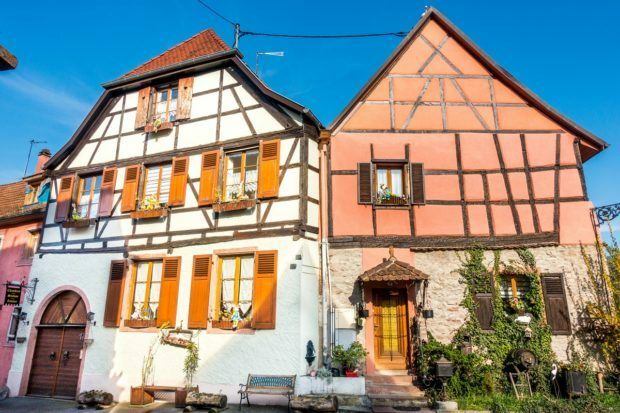 The half-timbered houses that still stand throughout Alsace are due, in part, to this prosperous time when the vins d’Alsace were exported by river all over Europe. Today, wines in Alsace are mostly white. (Unlike other places in France, Alsace uses the grape varietal name, which makes it a bit easier for visitors to know what they’re ordering.) The region produces some of the most well-known dry Riesling in the world along with Gewürztraminer and Pinot Gris. Pinot Noir predictably contributes to rosés and less predictably to some whites. Topping it off is the popular Cremant d’Alsace, a sparkling wine found on most menus and tasting lists. Most Alsatian wine options are dry, but there’s plenty of sweet wine to go around, too. Whether small, family-run wineries or slightly large co-ops or corporate endeavors, wineries in Alsace are generally open for visitors. These businesses produce some of the best wines in the world, but most will welcome you like family and invite you to taste as much as you’d like for free. It’s hard to think of a more enjoyable way to see some of the prettiest towns and landscapes in France. From Marlenheim to Thann, the 100-mile route winds its way through the lush French countryside. As in the nearby Moselle Valley and southern France’s Cotes du Rhone region, vineyards seem to go on forever with each town running into the next. In these foothills of the Vosges mountains, more than 1,000 wine producers make the astounding whites Alsace is known for. If you love wine, this trip is an ideal way to sip your way through vineyards large and small. If you don’t, the towns are the things that dreams are made of. Either way, all the elements combine into a fantastic day (or more) exploring Alsace. Because I was staying in Colmar, that’s where I began my road trip near the southern end of the wine route. In just 23 miles (36 km), I visited Eguisheim, Kaysersberg, Riquewihr, and Ribeauville. The following day included a further exploration of Strasbourg at the north end. Every visit to Alsace will be a little different, so I’m covering all the stops here. Don’t want to drive? 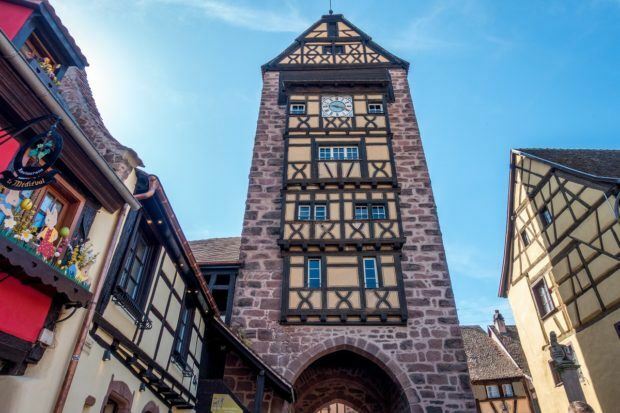 Consider this small-group day tour along the Alsace Wine Route. Colmar is the city that called me back to visit Alsace. 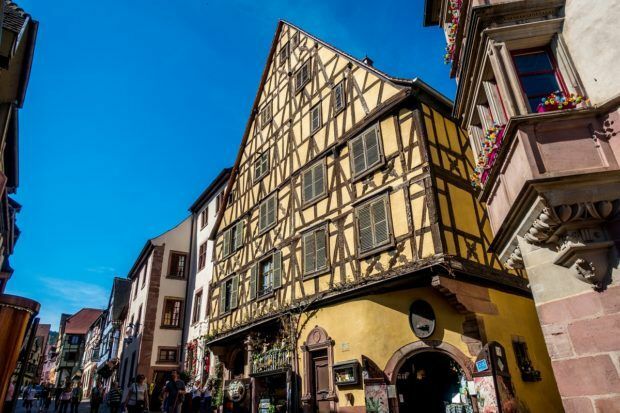 Like many of the other cities on the Alsace wine route, Colmar was spared most of the ravages for World War II, so it is full of history and amazing buildings that date back to the 15th century. The colors and architecture are breathtaking. 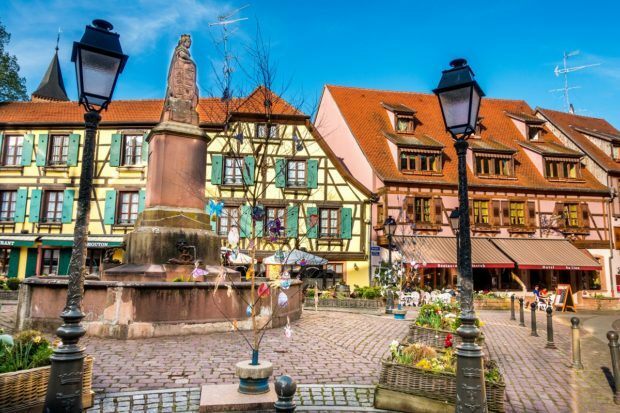 People often visit Colmar on a day trip or for its famous Christmas markets, but there are enough things to do in Colmar to fill at least a weekend if your vacation schedule allows. 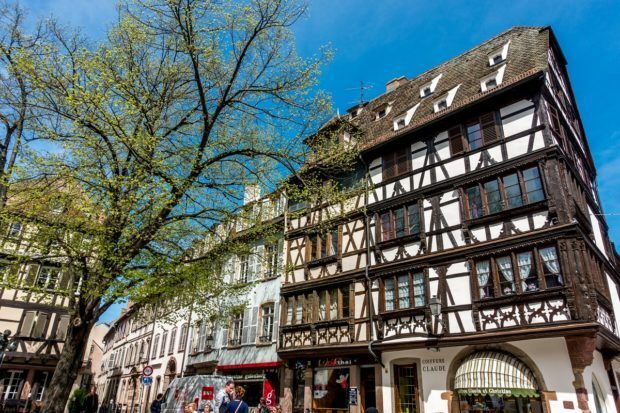 As one of the larger cities in Alsace, there’s a lot to explore in Colmar, and it’s all within a compact area. It’s possible to walk across the historic center in less than 15 minutes. Throughout Colmar you’ll find golden triangles emblazoned with the Statue of Liberty embedded in the sidewalks. 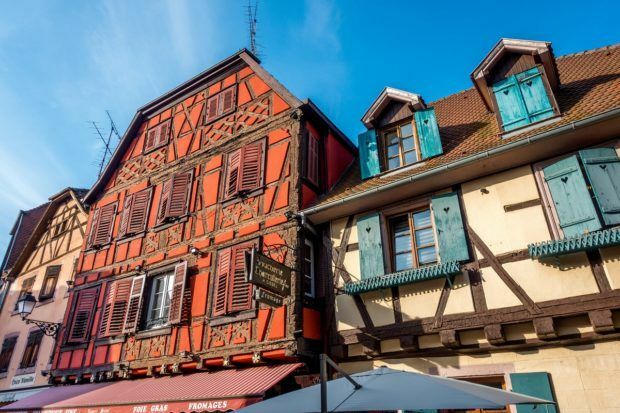 Following them will take you to a lot of the city’s main sights, including the museum dedicated to one of Colmar’s most famous sons, the sculptor of the Statue of Liberty. Just looking for these emblems and the historic panels that accompany them give you a great overview of the city’s history and the attractive buildings throughout the center. In a city full of beautiful things, it’s no stretch to say that Petite Venise (Little Venice) is the most beautiful. This group of half-timbered buildings along the canal feels like you’ve stepped into the middle of a fairy tale. Like Bruges in Belgium or Rothenburg ob der Tauber in Germany, it oozes charm and feels purpose-built for tourism though, in reality, it’s looked much the same way for centuries. I am a sucker for any and all local markets, so, of course, the covered market in Colmar was one of my favorite stops. Right on the edge of Petite Venise, it has about 20 merchants selling all the delicious French things. There are high-quality cheeses, quiches, produce, and prepared items. Even if you’re not as obsessed with markets as I am, it’s worth a stop. The Unterlinden Museum is one of the top museums not just in Alsace but in all of France. Located in a former 13th-century convent, the museum covers nearly 7,000 years of history. From prehistoric times to contemporary works, the Unterlinden Museum has a little bit of everything. Its star attraction is the Isenheim Altarpiece, a richly-colored work on multiple panels that dates from 1515. For an even more in-depth look at what to do, where to eat, and where to stay in this exquisite city, read our detailed article about Colmar. This is France, so there are many opportunities for trying wines at the restaurants and outdoor cafes throughout the city. In the summer, there are also often wine-related events in Place de l’Ancienne Douane in the city center. For a slightly more formal experience at a winery, don’t miss Domaine Karcher. Karcher’s vineyards are a few miles outside the city center, but their wines are made and aged in Colmar. They have a sparkling Cremant and a late harvest Gewürztraminer that shouldn’t be missed. If an experience here is at the top of your list for a trip to Alsace, you may want to consider booking a tasting in advance because they’re popular. 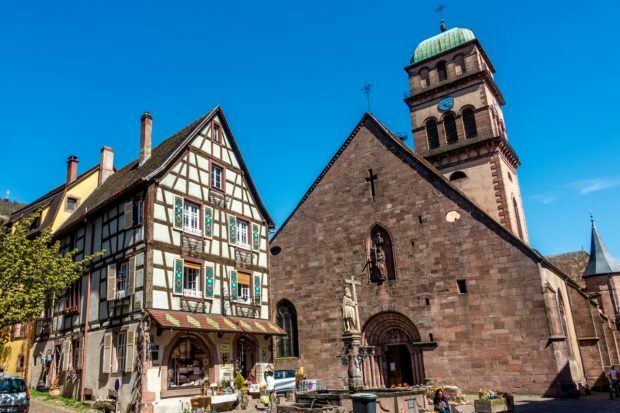 Less than five miles from Colmar, dazzling Eguisheim is a must-visit on the Alsace wine route. This village of just 1600 residents is impossibly inviting, which is one of the reasons it was voted as Village préféré des Français (Favorite French Village) in 2013. 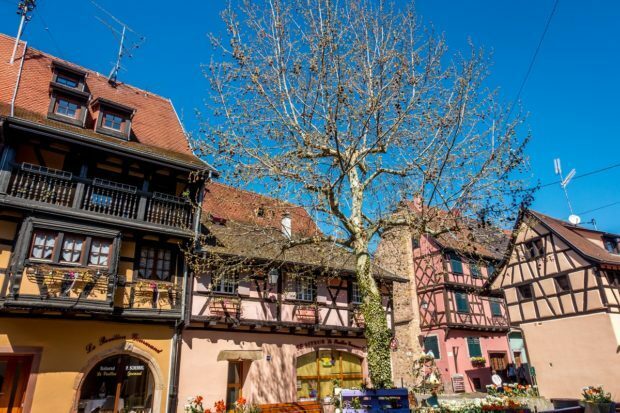 Eguisheim is known for being the birthplace of the Alsatian viticulture industry, and its micro-climate is perfect for wine-growing. Because of its proximity, Eguisheim is easy to visit via bicycle from Colmar. If you’re driving, there’s a parking lot on the edge of town that’s a quick, 5-minute walk from the heart of things. Just make sure you have coins for the parking kiosk. Eguisheim is a lovely town and a wonderful place to visit, but there’s not a lot to do—it’s more about being. The best way to get a sense for the town is on a self-guided walking tour. The old town wall no longer exists, but it left a circular lane lined with half-timbered houses that makes for a pleasant walk around town. Even if you stroll and browse to the max, it’s unlikely to take more than 45 minutes to an hour. If you start near the entrance to the town (near the tourist information office/TI) and go clockwise, you’ll see many of the prettiest things Eguisheim has to offer. Right as you begin the walking tour, you’ll come upon a place where the road splits. The building in front of you looks like it came directly from Hansel and Gretel. Keep going to discover a series of more charming houses, small squares, and local merchants selling jewelry, food items, and handcrafted leather goods as well as plenty more typical souvenirs. When you’ve made the loop, walk to the town center on Grand Rue where you’ll see the fountain, the “castle” (a private home built on the old castle’s footprint), and the 19th-century chapel of St. Leo IX. If your visit is like mine, there are likely to be plenty of storks around, too. They build their nests in the highest places in town and move in for good. Between the parking lot and the town center is Wolfberger, a more corporate-feeling winery which is atypical in the area. There’s a history exhibit, a place to smell different wine aromas, and a large bar and showroom. You can try just about anything your heart desires. I also visited the much smaller Pierre Henri Ginglinger, which offers free tastings of their organic wines near the TI. Settle in at one of the wooden tables in their tasting room, which feels more like a farmhouse or someone’s home sitting room than a corporate establishment. Their Muscat and Cremant were my favorite. Before visiting Kaysersberg, everything I read proclaimed that this town—with less than 3000 residents—would be impossibly touristy. Perhaps it was because I visited on a warm weekday in April, but I didn’t feel that way at all. I can’t vouch for how quiet it could be on a July weekend, but a shoulder-season visit was pleasant. Kaysersberg (Emperor’s Mountain) is filled with 15th-century homes and other landmarks. The arch through which you enter the town is from 1604. This place is properly old, not a creation for tourists. It doesn’t just feel like a step back in time—it is one. It’s also worth mentioning that this splendid place is the town where travel storyteller and worldwide vagabond Anthony Bourdain ended his earthly journey. Kaysersberg has grown wine for over 400 years. So if you like wine, photography, quaint villages, or really anything pretty, Kaysersberg is worth a stop. As with Eguisheim, a walking tour to experience Kaysersberg is the best “thing to do” there, though there are a few more destination sights than in the previous village. These are some of the highlights. Starting at the main square, Place de la Mairie, you’ll find the Town Hall (Hotel de Ville) and the TI. Walk up the main drag, Rue du General de Gaulle. One of the first things you’ll see on the left is a fountain featuring the Roman Emperor Constantine, which dates from 1521. It’s a lovely fountain and yet not overly remarkable in its design, but the fact that it’s been in this spot for nearly 500 years blew my mind. Continue down the street to see the buildings that have been decorated like actual gingerbread houses (smiling cookies and all). About the time you think the street is ending, you’ll reach the bridge where everything opens up into a superb scene of flowing water and more buildings. Drink it all in. Adjacent to the Emperor Constantine fountain is the Church of the Holy Cross which dates from the 13th and 14th centuries. 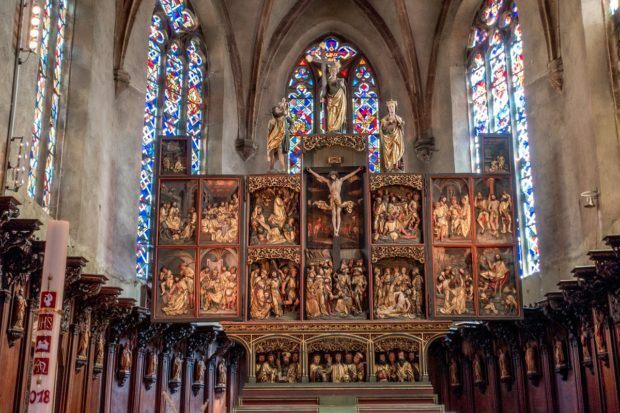 Step inside the Romanesque façade and appreciate the intricate 16th century altarpiece that shows the Passion of Christ. Sadly, the medieval stained glass was destroyed in World War II, so what’s here now is modern, but it’s worth admiring. The nearby region of Lorraine, with which Alsace is often paired in history, is known for its glass. At this workshop, you can see the craft materialize in front of your eyes. See the glassblowers at work and wander among the spectacular showroom pieces. Dr. Albert Schweitzer was a philosopher, theologian, and recipient of the Nobel Peace Prize (among other pursuits) in the early 20th century. The town where he was born pays tribute to the giant of a renaissance man in an interesting two-room museum near the end of Rue du General de Gaulle. Just a few steps from the TI, the Cave des Vignerons de Kaysersberg features 150 wine producers in the area surrounding Kaysersberg, so it’s an excellent place to try a wide variety of wines. Additionally, on the outskirts of town at Domaine Weinbach, the Faller family tends to the ancient Clos des Capucins. Try the Riesling Schlossberg Grand Cru and Gewurztraminer Furstentum Grand Cru. Visits at Domaine Weinbach are by appointment only. The next stop, Riquewihr, was only six miles (10 km) from Kaysersberg. Parking in a convenient lot just outside the city walls, I set out to see what this new town had in store. 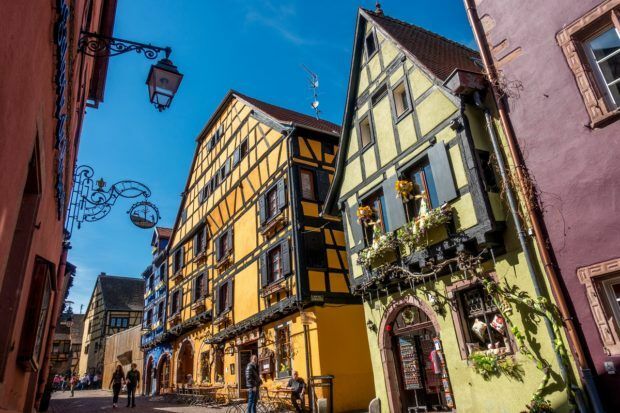 Like many of the other villages and towns on the Alsace wine route, Riquewihr has rightly been officially recognized as one of the most stunning places in France. The enchanting mix of lanes, courtyards, and bright buildings make it a great place to feel the joie de vivre of a day in France. It was immediately apparent why so many people said not to miss this stop. It’s impossible to say which town in Alsace is the prettiest because they all have a unique color or style to offer. 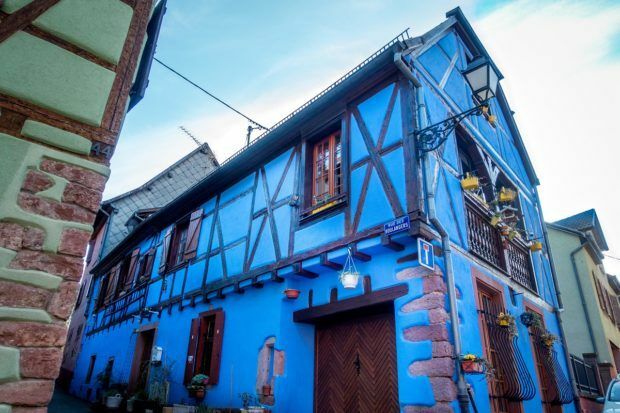 In Riquewihr, it was the brilliant royal blue and Crayon-box yellow that most caught my eye. 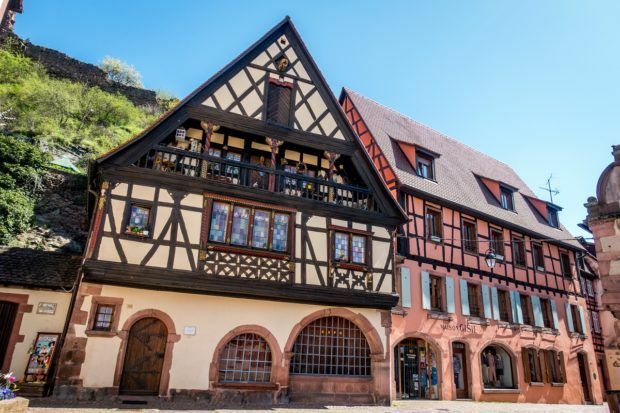 In what is surely a theme for this day trip, taking a stroll around the town is the best way to spend your time in Riquewihr. Fortunately, it’s easy to identify the main street—Rue du General de Gaulle—running up and down the hill through the center of town. Riquewihr is a fabulous array of stone houses, towers, cobblestones, shops, tasting rooms, and the largest half-timbered houses I saw anywhere in Alsace. The town’s architecture is so rich now thanks to its wealth from wine production during its heyday in the 15th to 17th centuries. There is a lot to see in a small space. If you start at the bottom of town at the Town Hall, you’ll see the map that shows Riquewihr as it was in 1644, surrounded by a double wall and a moat. At the time, this well-fortified wine village was a trading center for both Alsatian and German wine. As you head uphill, you’ll see the homes of men who managed the wine estates in the area centuries ago. Between them are businesses with elaborate wrought-iron signs advertising what’s inside. If you’re in the market for something delicious—cheeses, sausages, or other Alsatian delicacies—these are optimal places to explore. Near the top of town is an imposing guard tower, known as Le Dolder, that dates all the way back to 1291. In addition to its stunning beauty and the feeling of being frozen in time, Riquewihr is most famous for its wines known all over the world. 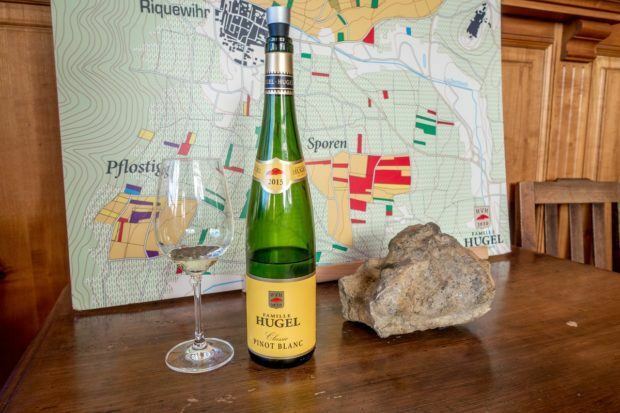 Hugel & Fils has produced wine here since 1639 and still operates a tasting room next to its cellars in the heart of the town. The family-run enterprise makes Muscat and Pinot Gris and is most known for their Alsace Riesling and Gewurztraminer. I bought a bottle of their Gentil—a blend of Riesling, Pinot Gris, and Gewurztraminer—to take home, though I didn’t have the willpower to make it that long. From Hugel, it’s a five-minute walk downhill to Dopff & Irion. The winery offers good-value wines, the best of which come from the Schoenenbourg Grand Cru. You can also taste their eau de vie offerings, which are some of my favorites. One of the oldest towns in Alsace, Ribeauville was the seat of the Lords of Ribeaupierre (hence the name “Ribeauville”) in the Middle Ages. The Lords built three castles in the surrounding area, the ruins of which can still be seen today. But despite its history and handsome features, the reason I came to Ribeauville was more straightforward—wine. 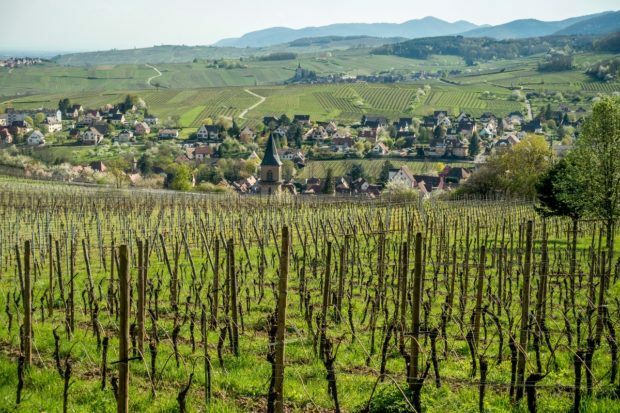 The towns throughout Alsace are known for their prolific wine production, but only Ribeauville has one of Lance’s favorite wineries, Trimbach Estate. 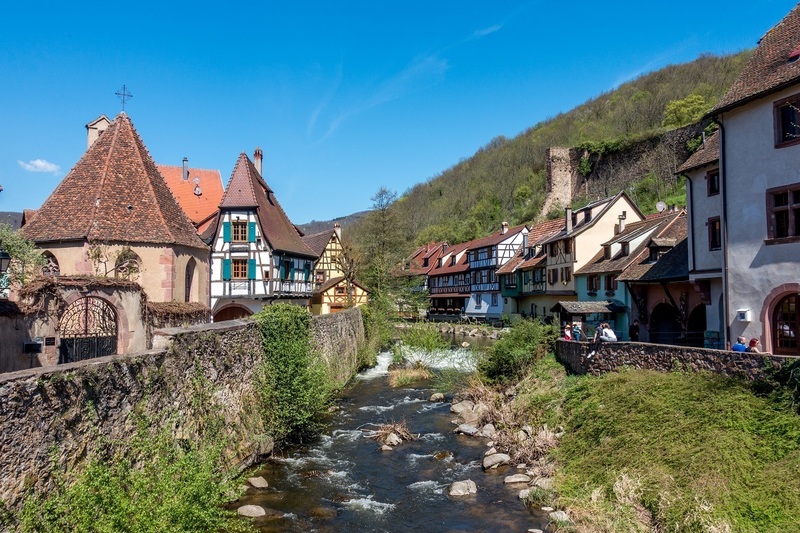 The chance to visit Trimbach in person and the ease of reaching Ribeauville from Riquwihr landed it on my list for Alsace. At 5000 residents, Ribeauville is one of the largest villages I visited in Alsace. In many ways, it retains the charm of the 17th and 18th century, but that is merged with more elements of a modern city than I saw in the other villages. There seemed to be more contemporary architecture and more car traffic along with fewer tourists. As with the other towns on the wine road, I wandered my way down Grand Rue past shops and antique buildings. 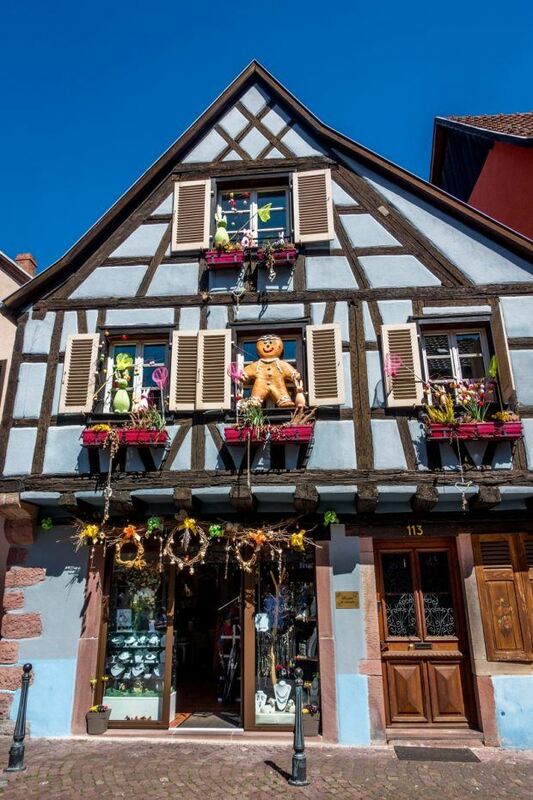 The Easter decorations were still up, lending an air of whimsy to everything (decorating for every season and holiday is a must throughout Alsace). Ribeauville has preserved parts of the old town walls and its defensive towers, including Tour des Bouchers, which originally dates from the 13th century. In the town, small lanes run into squares with fountains, and there is even a building from 1522 known as the Elephant Inn thanks to the paintings on its half-timbered façade. A sign points the way to the “quartier pittoresque” (picturesque area) where you’ll find some of the brightest buildings. Overall, Ribeauville did not impress me as much as the other towns I visited. Perhaps it was because the other destinations were impossibly pristine and pulled together. Contrast that with construction and revitalization projects and much work happening to restore the 400-year-old buildings to their formerly bright glory. I was left with the impression that in a few years, Ribeauville will be just as pretty as the other towns, but it’s not quite there yet. Trimbach Estate is one of the most famous Alsatian wineries. The Trimbach family has made wine in Alsace for 13 generations, stretching back to 1626. Lance has been drinking the white wines from Trimbach for over a decade, and even though he was not with me on this trip, I couldn’t pass up the chance to visit and buy something special that’s not exported to the US. I sampled a Pinot Blanc, a Gewürztraminer, and several Rieslings and walked away with a Vieilles Vignes (old vine) Riesling. On Grand Rue, Robert Faller et Fils, which has been making wine since 1697, is also a solid option. Stop in to try their Cremant d’Alsace and Gewürztraminer. 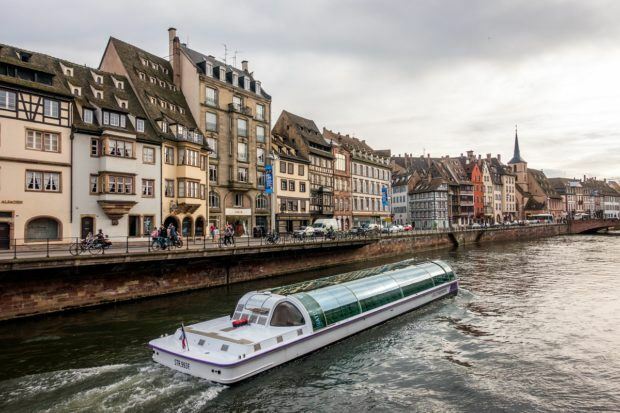 The capital of Alsace, Strasbourg feels like a much larger Colmar with more waterways, streetcars, and traffic. 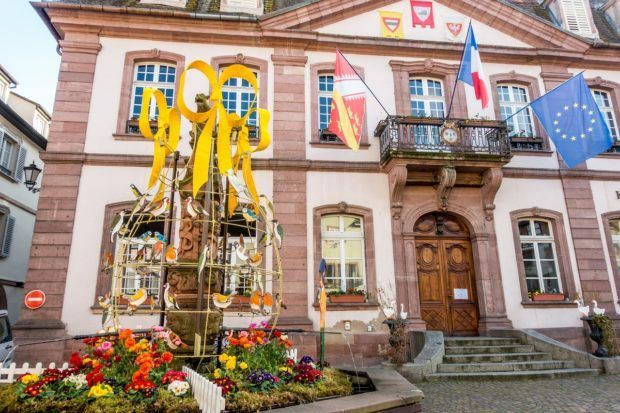 But despite its many modern additions, parts of this city of 275,000 people still feel very small-town, echoing the attractive parts of the rest of Alsace. 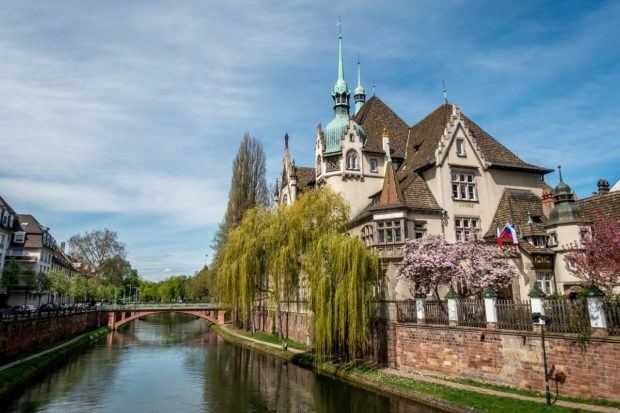 Strasbourg is easy to get to and well-connected to the rest of France and beyond via the TGV train. 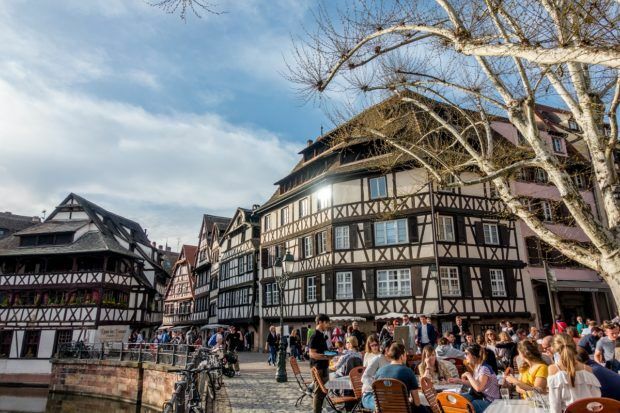 Strasbourg is worth at least a day on its own, but it is also a great place to start or finish a trip on the Alsace wine route. Wander its streets, appreciate the mix of Franco-Germanic culture, and take in all the sights the city has to offer. A university town, busy city, and capital of the European Union (along with Brussels and Luxembourg), there is a lot happening in Strasbourg. 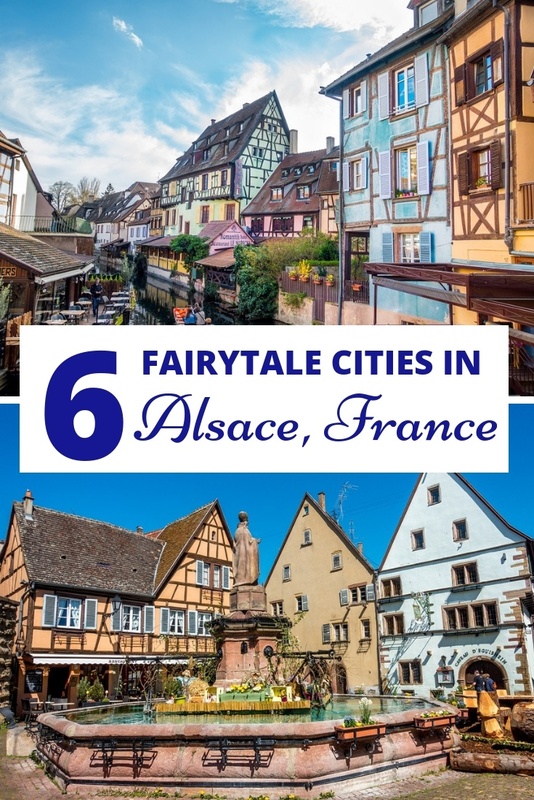 It definitely has the most to do of any of the cities in Alsace. 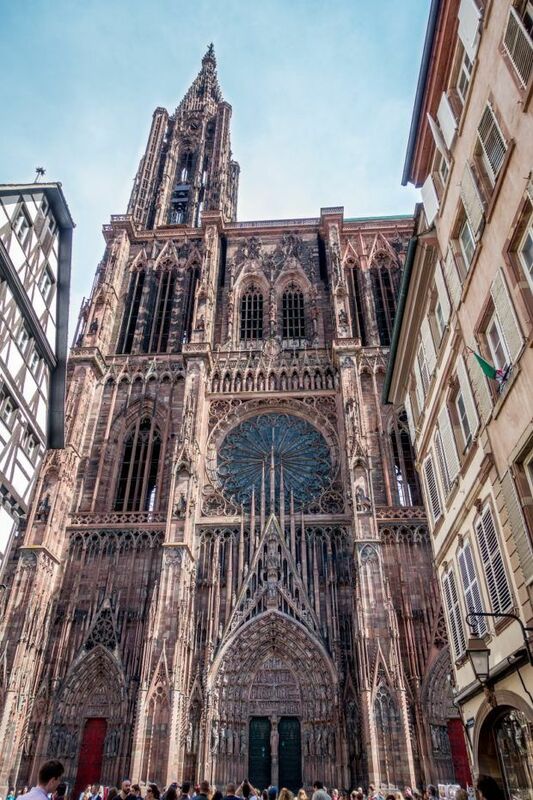 The 800-year-old Strasbourg Cathedral dwarfs everything in its general area. The red sandstone building seems to pierce the sky while tourists (myself included) crane their necks and crouch, trying in vain to get a photo that lets you capture the entire, massive thing. While the outside is worth the time to marvel at, the inside is worth a visit, too. The wide, Gothic interior is full of gold leaf, stained glass (most of it original), and carvings. Visitors looking for a workout can climb the 330 steps up the narthex for fabulous views of Strasbourg. The cathedral and its surrounding area–both old and new–have been listed as a UNESCO World Heritage Site. Much like Petite Venise in Colmar, Petite France is a picturesque quarter of canals, old workshops, and 16th- and 17th-century half-timbered buildings. It’s a photographer’s delight. And, even with the crowds that can fill its narrow alleys and bridges in high season, Petite France remains a delight to visit. On a sunny day, do what the locals do and head to Parc de l’Orangerie. Adjacent to the Council of Europe buildings, the park is the ideal place to laze away the day. Its 64 acres welcome cyclists, walkers, Ultimate Frisbee players, and more. For kids, there are play areas, a vintage children’s car track, and even a miniature farm. To see the city from the water, hop in one of the glass-topped boats that whip along the river. You’ll see everything from a unique vantage point, and a cruise is an easy way to get an overview of the city’s geography and history while resting your feet and preparing for the next wine tasting. For a unique wine experience, head to Cave Historique des Hospices de Strasbourg. This wine cave in the medieval basements of the city hospital was founded in 1395 and was renowned for the quality of its wines. Though actual tastings are limited to open doors (“portes ouvertes”) days, you can see the cellar and its ancient wine-making implements and visit the on-site wine shop featuring wines aged in the cave. There’s even a barrel from 1492 which holds one of the oldest wines in the world. 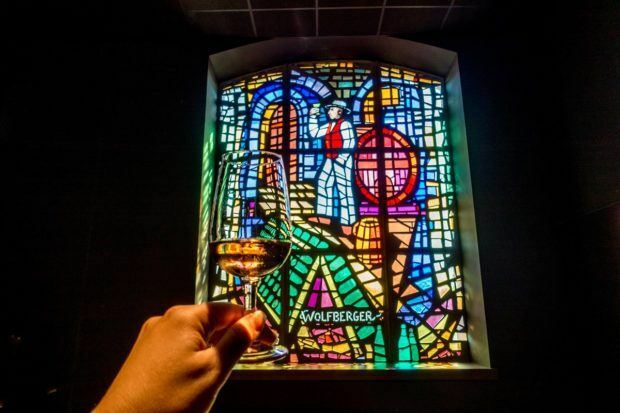 As an alternative, Wolfberger Winery (from Eguisheim) has an outpost in Strasbourg just a few blocks from the Cathedral. The easiest way to visit Alsace and the wine route is by car from Strasbourg at the northern end or Colmar at the southern end. Depending on your starting and ending points, it’s also possible to visit by bicycle or bus, especially if you’re visiting the villages nearest Colmar. From Paris: Strasbourg is about 2 hours east of Paris on the TGV train. Colmar is about a half-hour farther on the same train line. There are some direct TGV train options to Colmar, but others require a switch in Strasbourg. From Basel: The trip from Basel Mulhouse Freiburg airport—which serves France, Germany, and Switzerland—to Colmar is about 45 minutes. The train trip to Strasbourg is about 1 hour and 20 minutes.